Looking for hotels in Vasileostrovskiy? 1.1 miles from Petrovsky Stadium, Boutique Hotel Dom Rerikha is located in Saint Petersburg and provides rooms with free WiFi. Located around 1.6 miles from Chapel of St. Xenia of St. Good reception, very clean room. Boutique Hotel Meltzer is located in Saint Petersburg, 1.1 miles from Petrovsky Stadium, and has a garden, a shared lounge and a bar. This 4-star hotel has a spa experience, with its hot tub and... The room was luxury nice and very clean. It’s really a nice hotel . Located in Saint Petersburg, U Hotel offers a garden. With a terrace, the property also has a shared lounge. Staff on site can arrange airport transportation. At the hotel, each room includes a... Great value for money! Very clean and new room. Location is ok if you like Vasilevsky ostrov. Ideally set in the Vasileostrovskiy district of Saint Petersburg, Mark Hotel is located 1.3 miles from Petrovsky Stadium, 1.3 miles from Chapel of St. Xenia of St. Excellent location, staff, cleanliness and simplicity for the budget conscious traveler. Mini Hotel Na Bolshom prospekte V.O. Located in Saint Petersburg, within 1.2 miles of Lenexpo Exhibition Complex and 2 miles of Chapel of St. Xenia of St. Petersburg, Mini Hotel Na Bolshom prospekte V.O. 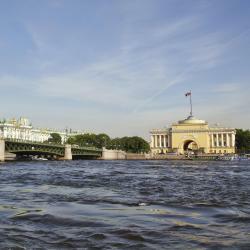 Sakvoyazh Hotel provides accommodations in Saint Petersburg. The property is located a 20-minute walk from Chapel of St. Xenia of St. Located on Vasilyevsky Island, within a 5-minute walk of Sportivnaya Metro Station, Vasilievsky Dvor Hotel features a sauna and a hot tub. Free Wi-Fi is available on site. Very friendly staff. Delicious pancakes. The place is petit, homely and very quiet (sometimes it really felt like I was the only guest until I met other people at breakfast). Many thanks for the heater, the kettle and the fridge in the room - they turned out to be vary handy. Surprisingly enough, I found the shabby first-floor hall (it was being repaired at the moment) to add a specific charming note. It is St.Petersburg after all, even the palaces are shabby there! :) The hotel itself is perfectly clean and modern though, so do not let the entrance scare you. The small and unique Trezzini Art Hotel is located in the historical and business center of Vasilyevsky Island, within a 10-minute walk of Vasilyeostrovskaya Metro Station and 20-minute walk of... We really liked our stay at Trezzini Art Hostel! First of all, we loved the location. This hotel is located in the historical center of St. Petersburg and offers free Wi-Fi and free parking. It is just a 5-minute walk from Vasileostrovskaya Underground Station. So we had several rooms booked as there were 8 people travelling. Featuring a bar, Oversize Piter Hotel is located in Saint Petersburg and is a 15-minute walk from Chapel of St. Xenia of St. Petersburg. Amazing STAFF. Clean and nice everything. For low budget is the best place to stay. Art Nuvo Palace features accommodations with free WiFi in Saint Petersburg. Really cheap place in good location. Service is good and rooms are clean. Worth its price. Set in Saint Petersburg, 2.1 mi from Petrovsky Stadium, Romar Hotel has rooms with free WiFi access. The property is located 2.2 mi from Lenexpo Exhibition Complex and 3.1 mi from Mariinsky Theater. Located 66 feet from the Gulf of Finland and 1.2 mi from Primorskaya Metro Station in Saint Petersburg, Boutique Hotel Grand offers free WiFi available in all hotel areas. Good hotel and excellent staff. Vladimir was very helpful! Featuring a wellness center, this hotel on Vasilyevsky Island is a 15-minute walk from State Hermitage Museum and Nevsky Prospect. It combines a central city location with facilities of a spa resort. Spa treatments, room view on the 7th floor, breakfast was very good. 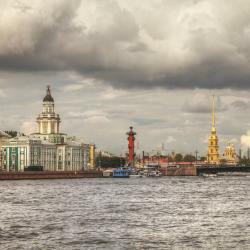 Solo Sokos Hotel Vasilievsky gallery hotel is located on Vasilievsky Island, within a 5-minute walk of Blagoveshchensky Bridge and Neva embankment. Level of service, sanitation, smiley faces. Located 30-minutes drive from Pulkovo airport and 3.4 mi away from the State Hermitage Museum in Saint Petersburg, Docklands offers accommodations with free WiFi and seating area. Every thing! It was new building, full of facilities, you can believe ! Located on Vasilyevsky Island, within a 5-minute walk of Sportivnaya Metro Station, Vasilievsky Dvor Hotel features a sauna and a hot tub. Free Wi-Fi is available on site. Very friendly staff. Delicious pancakes. This hotel is set on Vasilyevsky Island in Saint Petersburg, just a 5-minute walk from Lenexpo Exhibition Center. Free Wi-Fi and a 24-hour reception are featured at Apriori Hotel. It was very convenient to use the kitchen anytime. Free Wi-Fi and a 24-hour reception are offered at this hotel, located 10 minutes’ walk from Vasileostrovskaya Metro Station on Vasilevskiy Island in Saint Petersburg. Clean room and bath. Internet speed was ok.